theCityShouldBeDifferent is about bringing people into a lifestyle of engaging in making the Kingdom of God more tangible in our city. For those of you who follow Jesus as Lord, savior, lover of your soul and provider of everything we need, this lifestyle of engagement, where all our lives (our home, work, church, hobbies, our serving others) is a very natural response to meeting this God and encountering His overwhelming love! Next week, some volunteers, a group of friends, is coordinating a banquet. It's not just an ordinary banquet, it's a Celebration of Children, and children, 5th grade to High School, will do all the serving, speaking, singing and presentations. The children are drawn from the classes where these volunteers have served as mentors, and they will share stories of the impact that volunteers who engaged in their lives had on them. AMIKids.org is the beneficiary of the proceeds of this year's banquet. AMI serves youth who have gotten into trouble, and they see tremendous results in giving them hope and the tools to change. 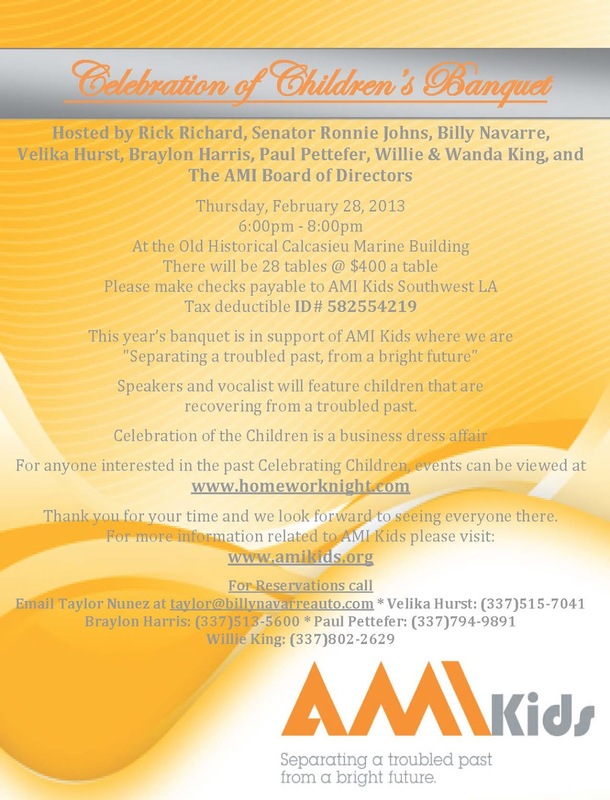 "Seperating a troubled past from a bright future" is their goal, and AMI Kids SWLA is doing a good job. While the evening has a fundraiser component, it's mainly about the event - seeing the children demonstrate that they can do more and grow and learn to contribute to the needs of others. You should come and see! Hot Button Editorial by KPLCTV, here (He did this following the Celebration of Children Banquet last year).